Brazilian violinist Omar Chen Guey has been a soloist with the Brazilian, Campinas, Goiania, Minas Gerais, Claudio Santoro National Theater, Sao Paulo University, Sao Paulo Municipal, State of Sao Paulo Symphony Orchestras, the Amazonas Philharmonic, Petrobras Pro-Musica, Experimental Repertoire, Manhattan School of Music, Stony Brook University Symphony, Maidstone Symphony, Qatar Philharmonic and the Seychelles International Music Festival Orchestras. He performed for the King of Norway, Harald V. He is a prizewinner at both Tibor Varga and Lipizer International Violin Competitions. He has performed chamber music with Lynn Harrell, Ani Kavafian, David Finckel, Lawrence Dutton, and Colin Carr. He received a DMA from Stony Brook University and a Master from Juilliard. His main teachers were Robert Mann, Sylvia Rosenberg, Philip Setzer, Ani Kavafian and Pamela Frank. 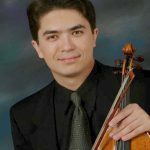 Omar is a member of A Far Cry Orchestra and was assistant concertmaster of the Orquesta de la Comunidad Valenciana, in Spain, directed by Lorin Maazel. His premiere of the concerto for violin and orchestra by Jean-Charles Gandrille with the Qatar Philharmonic, conducted by Thomas Kalb, has been released on the French label Paraty.